Swype is an alternate keyboard for mobile devices running Android and Nokia operating systems. how it works is you have your standard keyboard layout, then you “swype” your finger from letter to letter trying to form the word you’re typing. It is very similar to the stock Android keyboard that came with Jellybean 4.2, but with some key features like regular updates and others that are helpful especially for non-English markets. I personally use this keyboard since it it very easy to use and I don’t need to look at my phone while I’m sending an SMS, writing an email or creating a note. So if you were to type in say “hello”, you would start with your finger on the “h” key then slide your finger to “E” then “L”, since it’s double L, you would make a small looping motion there before moving your finger to “O”. The whole process takes about 1.5 seconds. That way, I’m able to quickly send messages without looking. One of the key features that I like is that you can teach it the words that you normally use. So if I were to type “kamusta”, I’d do it manually the first time, typing each letter, then I can save the word so next time I can just swype it. The application is able to work reliably in that I seldom get frustrated. Installation is easy, just visit beta.swype.com and create an account. You’re able to use the same account across devices. I had my account back when I was using this for Symbian 6 (Nokia 5800) and I am able to use the same account now for my Samsung Galaxy S II. 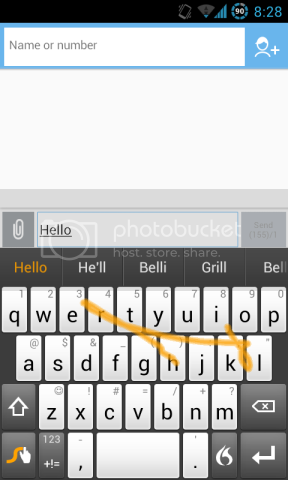 There are currently 2 versions of Swype: the official numbered version and the beta version. I personally use the beta version since it’s pretty stable and I find that it somehow predicts the words more accurately.